گرد و غبارهای ترافیکی بیشتر دارای سطح بالایی از فلزات سنگین است که می‌تواند سلامت انسان و محیط زیست را تحت تأثیر قرار دهد. در این مقاله تلاش شده است با اندازه‌گیری غلظت فلزات سنگین در خاک و گرد و غبارهای موجود در مناطقی از شهر مشهد و در نواحی با حجم ترافیک بالا و همچنین در ماه‌هایی که بیشترین حجم ترافیک را دارند، میزان آلایندگی این خاک‌ها بررسی شود. بدین منظور 23 نمونه خاک سطحی از سه مسیر اصلی شهر مشهد به‎گونه‎ای که همه سطح شهر را پوشش دهد، برداشت شد و غلظت کل عناصر Ni، Zn، Pb،Cr وCu اندازه‎گیری شد. سطح آلودگی خاک شهری با استفاده از شاخص زمین‎انباشت(Igeo) ، شاخص آلودگی(PI) و شاخص آلودگی یکنواخت (IPI) بررسی شد. 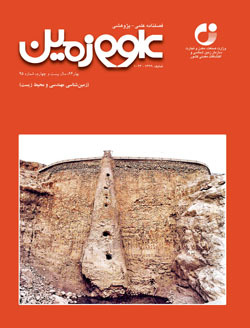 شاخص آلودگی نشان می‌دهد که همه نمونه‌ها سطح بالایی از آلودگی به وسیله سرب (3.688-74.16) دارند. همچنین فلز روی (1.484-7.23) نیز در بیشتر نمونه‎ها سطح بالایی از آلودگی نشان می‌دهد. در حالی که نیکل (1.01-1.953) و مس (0.678-1.945) سطح متوسطی از آلودگی نشان می‌دهند. کروم (0.246-0.772) نیز در همه نمونه‌ها سطح پایینی از آلودگی نشان داد. منابع احتمالی آلاینده‌ها با استفاده از ضریب همبستگی پیرسون و تحلیل اجزای اصلی ارزیابی شد. نتایج تجزیه، غلظت‌های بالای فلزات سرب، مس، روی و نیکل را نسبت به میانگین غلظت این فلزات در بخش بالایی پوسته زمین نشان داد. وجود ضریب همبستگی مثبت میان عناصر سنگین روی و مس و همچنین سرب و روی، نشان‌دهنده منابع تولیدکننده همانند است که همان سوخت خودروها و استفاده از ترمز در وسایل نقلیه است .نتایج به دست آمده از روش استخراج ترتیبی نیز نشان از این دارد که گونه‎سازی عناصر Pb، Zn و Ni بیشتر در فازهای ناپایدار (F1+F2+F3+F4) صورت گرفته که نشان‌دهنده منشأ انسانی برای آنهاست، ولی عناصر Crو Cu بیشتر در فاز پایدار (F5) توزیع شده‌اند که بیانگر منشأ بیشتر طبیعی برای این دو عنصر است. Traffic dust often contains high concentrations of heavy metals and can influence on environment and human health. In this study, we tried to measure heavy metals in street dusts and soil in the city of Mashhad and sample collections were carried out at the time and location of high traffic. For the purpose of this study, twenty three samples were collected from three main paths that cover the entire city and total concentrations of five heavy metals (Ni, Zn, Pb, Cr, and Cu) were measured. The index of geo-accumulation (Igeo), Pollution index (PI) and integrated pollution index (IPI) were also calculated for the contamination levels of the metals in the city of Mashhad,. The pollution index represent that all samples are highly polluted by Pb (3.688-74.16) and most of the samples are highly polluted by Zn (1.484-7.23). However, Cu (0.678-1.945) and Ni show medium level of pollution in the samples (1.01-1.935). Chromium in all samples show low levels of contamination (0.246-0.772). Possible sources of the pollutants were assessed using Pearson correlation and principal components analysis. The results of this analysis show high concentrations of metals such as lead, copper, zinc and nickel in the soil samples as compared to UCC (Upper Continental Crust). There is a positive correlation between heavy metals of zinc and copper as well as lead and zinc, which indicate the source of these metals, can be fuels as well as powder of shoe brake of vehicles. The results of the sequential extraction procedure also imply that the elements of Ni, Zn and Pb has occurred in unstable phases (F1+F2+F3+F4), indicating their human origin. But the elements such as Cr and Cu are mainly on stable phases (F5), which represents natural origin for these two elements.